A reception area is a customer’s first impression of a business. Its design sets up the greater context of what their experience will be — if great care has been taken to create the reception area, customers can expect the same if not higher level of care throughout their service. 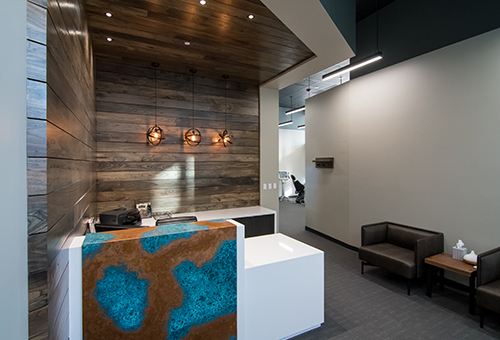 So when Bubon Orthodontists was designing their 12th Milwaukee-area office downtown, they wanted to make an impact with a spa-like welcome to patients, not a clinical one. Rich Pipek of in.studio architecture specified Wisconsin Urban Wood for the reception area because of its visual warmth and comfort, unique natural variation in character, and its back story — which is a great conversation piece while waiting for an appointment. Wudeward Urban Forest Products worked with in.studio architecture to determine what the ready-to-install finished product and final design (wall cladding) should be. We were easily able to source the materials in a timely and budget-friendly manner because of the team’s clear communication and Rich’s confidence in the Wisconsin Urban Wood supply chain.